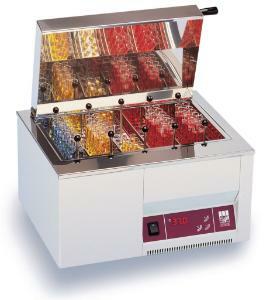 The circulation system equipped in these water baths helps to maintain an optimal temperature uniformity. Bath interior, heating element, lid, cover frame and perforated floor made of stainless steel. The outer housing of the system is corrosion resistant and made of powder-coated, electrolytically galvanised sheet steel. An electric motor with rotary magnet is flanged to the bath floor which transmitted torque to the PTFE coated stirring magnet and hence the water flow in the bath occurs. Used for incubations and inactivation of cultures, such as for warming bacteriological media, carrying out chemical reactions or thawing samples.